The multi-award-winning Jack Thorne, the playwright behind Harry Potter and the Cursed Child, breathes new life into Georg Büchner's Woyzeck, one of the most extraordinary plays ever written. 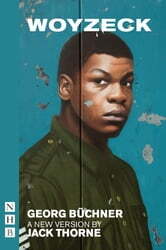 Jack Thorne's new version of Woyzeck premieres at the Old Vic Theatre, London, in May 2017, in a production starring John Boyega in the title role. Heryere noktalar çizmek isteyen küçük uğurböceği Sevgi'nin hikayesi. Türkçe-İngilizce. / The story of the little Ladybird Marie, who wants to paint dots everythere. Turkish-English.